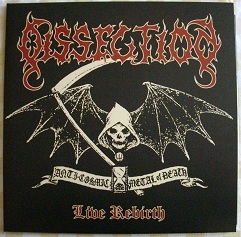 Swedish Black Metal legends Dissection had only released two studio albums before they embarked on the “Rebirth of Dissection” tour that kicked off with this show in Stockholm (listed on the LP jacket as September 2004 but it other sources suggest that the show was actually in October!). 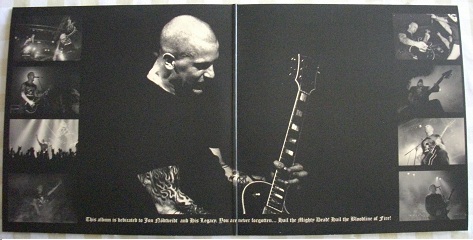 The band had disbanded in 1997 following the imprisonment of guitarist/vocalist Jon Nödtveidt as an accessory to the murder of an Algerian man in Sweden. Upon his release in 2004, Nödtveidt quickly assembled a new line-up of Dissection for the tour captured on Live Rebirth. For a band with only two albums of material to draw from, this is an exceptionally strong set of well-written and passionately performed tracks. The atmosphere and excitement at the show is well captured. The taped intro of instrumental track At the Fathomless Depths combines with the enthusiastic crowd cheering to build the excitement level for the first track proper Nights Blood so the feeling of being at the gig is palpable from the offset. In fact, the opening song is exciting and epic enough to be worth the price of admission alone. Dissection’s take on extreme Metal is grounded with a strong grasp of songwriting and pacing. There are stunning, memorable riffs in abundance here and, although the hoarser vocals and dark atmosphere may be off-putting for some, there is much to love here for fans of the NWOBHM era and other older acts like Mercyful Fate. Highlights for me include Where Dead Angels Lie and Maha Kali (the only new track here). These are absolutely thrilling and timeless, both delivered with an enigmatic folky lilt. Maha Kali also builds to a fantastic climax with its exotic feel bolstered by female Hindi vocals. The Somberlain evokes Iron Maiden with its melodic guitar harmony lines and there is also an excellent cover of Tormentor’s Elisabeth Bathory. Another band for me to check out! Overall, this is an incredible Metal live album and is right up there with the best of them. It’s dripping with atmosphere, epic in scope and there is not a single track on here that is anything less than incredible. For such a short-lived band to have created a set like this is pretty remarkable. Jon Nödtveidt would commit suicide in 2006. Buying Note: This full gig is available on DVD as Rebirth of Dissection and also available as Live in Stockholm 2004 on CD and LP but that version has some tracks removed and some are shortened. 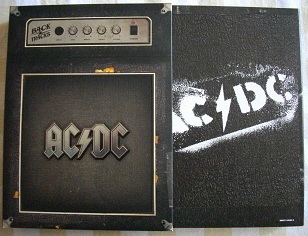 This edition, released in 2010, by the excellent High Roller Records has the full set intact. Napalm Death – Grind Madness at the BBC Massively groundbreaking and influential Peel Sessions from the Extreme Metal pioneers. The first from 1987 is the best. Essential. Rollins Band – End of Silence and Weight Really enjoyed End of Silence last week so another listen was required and I’m so glad I’m finally getting to know Weight better too. What a band. I even made it all the way through to the excellent live bonus tracks this time. Check me! The Black Crowes – Three Snakes and One Charm The glorious “Beard Years” of the Crowes resulted in this album and Amorica, their two finest moments. Quality adventurous stuff. Then they went and shaved. Dream Theater – Metropolis Pt. 2: Scenes from a Memory I’m not entirely up on DT’s career but this is fantastic and hasn’t been far from my ears for the past few years. A band that has managed the feat of both playing in odd time signatures and staying in decent hotels. Bill Bruford would be proud. In other news, I met James LaBrie and Jordan Rudess in a shop once. Nice guys but they couldn’t pronounce “Braehead” to save themselves. Slade – In Flame A great soundtrack to a great, gritty movie. How Does it Feel and Far, Far Away are the well-known hits but I absolutely adore Them Kinda Monkeys Can’t Swing which is an awesome slide-driven rocker. I love Slade more with every passing year. KISS – Dynasty and Rock and Roll Over Possibly my two favourite studio albums from the original line-up. I’m going to give a shout out here for Dirty Livin’ on Dynasty. A real sultry effort from the undervalued Peter Criss, it also features a feedback solo from (I’m guessing) Ace Frehley which is a shivers-down-the-spine moment. Rock and Roll Over is more signature-style KISS though and I would treat anyone that didn’t like it with extreme prejudice. Charred Walls of the Damned – Charred Walls of the Damned I’ve went back to this often since its release. It’s a formidable blast of modern Metal but with a really appealing melancholic melody running through it. It’s very addictive stuff! The song Blood on Wood is the stuff of training montage dreams! Guns N’ Roses – Chinese Democracy Really pleased with this on vinyl. A great album that just got better. This feels like it was meant to be heard this way. Yes – Drama Yes have had more than their fair share of drama but never more so than when Buggle Trevor Horn took over the mic. His glasses may have looked daft but that didn’t stop this being an awesome and surprisingly heavy Yes record. One of the great underdog albums. Here’s some stuff that’s been bothering my inner Bank Manager. The Steelbook is shiny, it excites! Another excellent Maiden DVD. This is the HMV exclusive edition. Not especially fussed about Steelbooks or stickers but this was the cheapest version I could find and, you have to admit, it’s purty! You can order online with HMV now and pick your order up at your local store… Good idea! I can’t bear waiting on the post to arrive. The Final Frontier album has proved a real grower and has received many listens lately so I wanted to see and hear that stuff captured live. 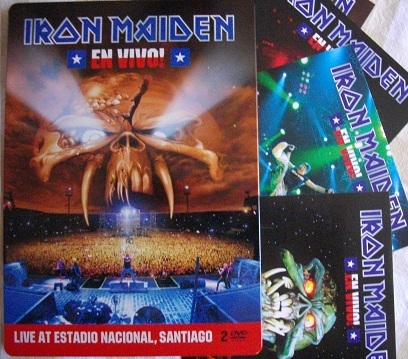 I really respect Maiden’s commitment to their new material and the intervening retro tours are a great idea too. The new tracks sound great on this, especially Coming Home. “En Vivo” translates to English as “Live” which is a bit disappointing. I thought it was going to mean something cool like… I dunno… “Have at you” or something like that. I’ve mentioned this album a couple of times in my listening notes and it has been getting many, many plays. One of the strongest albums of the year. It’s a real relief to hear a new album that is as good as this. There are still classics waiting to be written! The small one that doesn’t come with an amp! I don’t need a whole bunch of bonus tracks to rate a reissue highly. A good remastering with entertaining liner notes applied to a well-chosen classic album is quite enough for HMO. I can’t help feeling that more could have been done with this though, like with the recent Queen reissues. It just seems a bit stingy. I’ve only given this a couple of listens but KISS are always a bit of an Autumn/Winter proposition for me so I reckon I might start listening to this more as the year progresses. Paradise Lost – Gothic Monday morning again and what better way to start the week than with misery mongers PL! Up and at ‘em! Not listened to this for ages but dug it out after seeing it in Kerrang’s 666 Metal Albums You Must Hear Before You Die(!) magazine. It’s the toilet read that keeps on giving. As you can probably guess from the title, Paradise Lost were starting to introduce a Goth style to their established Death Metal making this a pretty unique transitional and innovative album in their catalogue. The Darkness – Hot Cakes I’m loving this more with every listen. It’s good to have them back. The Plasmatics – New Hope for the Wretched and Metal Priestess EP New Hope… is the Punky debut from The Plasmatics who hadn’t quite found their voice at this point. But it’s great fun and, coincidentally, also appears in the Kerrang mag. They had found their sound by the time of the later Metal Priestess EP but the debut has its fair share of classics like Butcher Baby and Monkey Suit. Genesis – We Can’t Dance Phil Collins’ final studio effort with the mighty Genesis finds the pop songs joined by some moodier tracks like No Son of Mine, Dreaming While You Sleep and the excellent Driving the Last Spike which I absolutely love. Driving The Last Spike has the kind of emotional build that’s reminiscent of Marillion and there is a superb performance of it on the Way We Walk live DVD. The Dictators – Go Girl Crazy A great album for fans of Alice Cooper, early KISS and Blue Oyster Cult although it’s a bit scuzzier and wackier than any of those acts. Also features the legendary Ross the Boss who would later form Manowar thus achieving complete godliness. Guns N’ Roses – Chinese Democracy This long-delayed album proved to be well worth the wait and it increases in my estimation with each passing year. Just bought the vinyl edition because I had a notion the album would make a great LP. I was right, some albums are so good you have to buy them twice… although I did wait for the inevitable price drop! The Wildhearts – The Wildhearts Easily one of the greatest albums of the last 10 years. 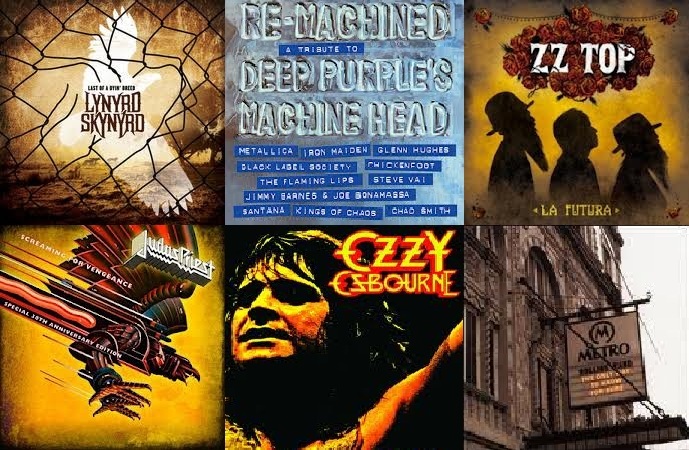 Brilliant hooks and most of the songs veer off into epic, tightly composed riff journeys. There’s also a DVD called Live in the Studio: A Film by Tim Smith where they bang the whole album out live in a recording studio. Which is way more entertaining than it sounds, I promise! 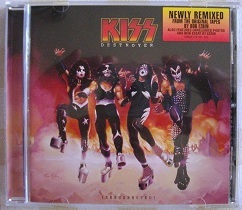 KISS – Destroyer Resurrected OK remix of the iconic album adds some instruments and oomph in some places but manages to lose half a beat from Flaming Youth. Try air-drumming to that! Also, the cover wasn’t used because it was too violent? I thought it was cause they had the wrong outfits on? Danzig – Danzig II: Lucifuge This taut Blues-Metal workout is one of the evil-Elvis’ greatest achievements. Love Danzig… but not so much that I’d want to move in with him or anything. Rollins Band – End of Silence An absolutely primal album. This was my introduction to Henry back when it was released and it’s one of those albums that refuses to grow old or get too familiar. For such a long record there is not a wasted moment here. Here’s a wee round-up of things that might be burning a hole in my wallet sometime soon! I have always enjoyed Skynyrd in the past and have been pretty keen on the post-crash line-ups too. I really rated The Last Rebel and Edge of Forever especially, both excellent albums. I have to say that they’ve lost me a bit on the last couple of releases. Didn’t rate Vicious Cycle much and didn’t even buy Gods and Guns. I am rarely in the mood for this kind of bluesy Rock these days so I think I’m going to have to leave this on the shelf. Pretty surprised to see ex-Black Crowe Johnny Colt popping up here though, when did that happen?! TEMPTATION RATING: 2 out of 10 Yeeee…..naw. Usually these Fan-Packs are new albums packaged with a bonus magazine. This one feels like a magazine with a bonus CD so this is priced way over the mark at £15. Iron Maiden and Metallica’s contributions are intriguing but I really don’t do tribute albums so I’m going to find this easy to resist I think. Machine Head isn’t even Purple’s best record! Discuss. TEMPTATION RATING : 3 out of 10 For Maiden and Metallica. Saw this in Fopp today for a £10… momentarily tempted but I managed to put it back. I have plenty of ZZ Top as it is, some of it has been underplayed. I know Martin Popoff really rates modern-day Top which is encouraging but I might just leave this until I’m in a genuine mood for it. It’s not going anywhere right? TEMPTATION RATING: 7 out of 10 Not now but I’ll probably pick this up in the futura. A great Priest album. The main money shot here is the DVD of their performance at the US Festival. You often see images of Priest performing at this festival in articles and websites about them so this is a pretty iconic show for the band. It is also only £10 which would be an ok price tag for the DVD on its own anyway so it doesn’t feel like I’m being totally ripped off. The elephant in the room is the Live Vengeance ’82 DVD which has all these songs from the same era, is also pretty iconic and has a longer set-list. I could be swayed either way on this. Maybe I’ll hold off until I have a really bad day or something like that. TEMPTATION RATING: 8 out of 10 Hard to imagine I won’t treat myself to this at some point. Been a bit of a debate here about the relative merits of Ozzy’s live releases. It put me in the mood for this. It’s an odd line-up featuring Brad Gillis on guitar, filling in for Randy Rhoads after his tragic and fatal accident. But it’s still Diary-era Ozzy and looks pretty entertaining. It also looks like it might keep coming down in price so I might hover around it like a vulture for a while longer. TEMPTATION RATING: 9 out of 10 This DVD isn’t going anywhere and neither am I. See you at the bargain bin. Been on a Rollins kick and this live album comes heavily recommended. It’s also a strong contender for the Live After Live After Death column I’ve been doing (if it’s as good as Aaron and Mike say it is!). Going to have a poke around on Discogs and see if I can get this for a good price. Can I also just add that the title is an inspired title for a live album. TEMPTATION RATING: 10 out of 10 The only way to know is to buy it! Paradise Lost – In Requiem Paradise Lost have had a remarkable career and this is one of their greatest releases. Classy Doom Metal with great melodies. Vocalist Nick Holmes gets better with every release and sounds particularly Hetfield-esque on this one as does the mighty guitar crunch. Pantera – Vulgar Display of Power and The Great Southern Trendkill Vulgar Display is another album with the Hetfield “mega-crunch”, as Phil Anselmo would say. Got right into this so I stuck on the less familiar Trendkill too as it features Drag the Waters, one of my favourite tracks of theirs. The Darkness – Hot Cakes It’s great to have this band back. I really enjoyed One Way Ticket a lot so I had high hopes for this. As with their other records it takes a while to fully reveal its charms but this is already an album of the year contender. Absolutely loving this and it’s been getting played a lot. She’s Just a Girl, Eddie is possibly one of the best songs of the year so far, along with Van Halen’s You and Your Blues and Ginger’s Forget About It. Danzig – IV Got to love Glenn Danzig. For all he’s become a sort of walking meme (I especially like that he appeared on Google Street View), he’s had an enviable career and been a massive influence in Rock and Metal. I have to fess up and admit I’ve not followed his career beyond this album though as this was the last to feature the classic Danzig line-up that featured John Christ on guitar. Am I missing much? Ginger Wildheart – 555% Been listening to the first Disc of this a lot but I’ve finally progressed to the weirder second disc which is… weird. If the third CD of this album continues to be weirder it might just be an hour of Spooky Halloween Farts or something like that but we’ll see. You can pledge money for the prolific Ginger’s next two projects(!) here. One of these, Mutation, is going to be Ginger’s first venture into Grindcore which I’m pretty intrigued by. Queen – News of the World (and Bonus EP) Is it possible to say the phrase “Classic Queen” without doing it in Alan Partridge’s voice now? Not for me. Anyway, this is “Classic Queen” and went down a storm this week as did the stingy but enjoyable bonus EP. Def Leppard – X Er… I quite liked this when it came out. A shameless but failed stab at pop stardom. There are good tracks on here but it really could do with a bit more beef and a lot of the tracks are just a bit doleful sounding. They also show themselves up by channelling Steve Clark on the track Scar at the end of the record so you come out of it wondering why the whole album wasn’t that good. An uncomfortable entry in the Lep canon. Rollins Band – Hot Animal Machine Been on a real Rollins kick so thought I’d revisit his debut solo record. It reminded me of Discipline-era King Crimson. Angular and jazzy with Henry’s righteously angry vocals and lyrics. More listens required so I think this’ll be showing up here again. The Jimi Hendrix Experience – Axis Bold as Love My favourite Hendrix album. This is perfect bliss and a great late-night listen. Dug this out after reading a great piece on it in Record Collector. Aerosmith – Permanent Vacation Only managed Side A of this and I was done. I can’t even begin to tell you how much I love the song Magic Touch. Hirax – Not Dead Yet Gave this a good whirl while writing up my Buying Round Up last week. 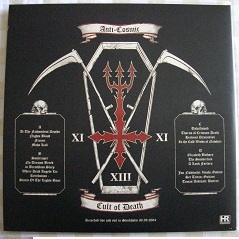 Fun stuff but I can’t remember anything about it other than the opening track, the excellently named Demons Evil Forces! I’m not the biggest Sammy Hagar fan in the world but I particularly enjoyed the period that followed his (initial) acrimonious split from Van Halen in the mid-90s. Having put together a great backing band called the Waboritas he proceeded to bring out a trio of joyous Rock albums – Red Voodoo, Ten 13 and Not 4 Sale. 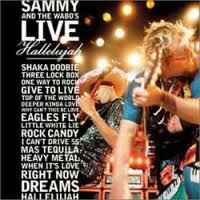 With the Waboritas, Sammy had also become a formidable feel-good live act too and following a very competitive jaunt with Dave Lee Roth (the Sam and Dave tour) it was decided to capture the fun on CD. The first thing that has to be said about Live Hallelujah is that it is LOUD. I actually can’t think of a live album that sounds more like being in the front rows of a concert than this one. Sammy’s older tracks are bristling with the kind of unhinged guitar assault that would make Ted Nugent proud and the Van Halen-era tracks are feel-good bliss (some featuring a speaker-rattling Michael Anthony and When It’s Love features Gary Cherone). Although Sammy and Vic Johnson are fine players they sensibly chose some of the least flashy Van Halen tracks which means they sit more comfortably alongside the non-VH songs. The newer tracks like Shaka Doobie, Deeper Kind of Love and Little White Lie are also strong, fitting in perfectly with the old favourites like Three Lock Box and Heavy Metal. In fact, one of the great features of the album is how it assimilates material from a long and varied career into a really cohesive set. This has obviously never become a classic of any description but I really enjoy this and it actually served as a gateway for me to get more into Sammy’s and Van Hagar’s albums. Overall, if your ears can take the remorseless pounding of the production, this is just great fun and one of the best examples I can think of where a live album manages to evoke the excitement and vibe of a being at a really entertaining Rock show. If I’m looking for an album to put a smile on my face and a spring in my step this would be a strong contender and there can’t be a higher recommendation than that.